Suitable for all ages (although babies or kids that can't manage the walk would be better in a backpack carrier). A short bush walk winds downhill ending in a beach from which you can see Split Apple Rock in all it’s glory! It’s a nice beach for sand play or paddling although you can’t actually get to the rock without a kayak or boat but you can admire it from afar! It’s worth checking the tide times here. If you aim for low tide, you’ll have more beach to play on and there are caves and rocks to explore at the northern end of the beach. There’s a toilet at the bottom of the walking track but otherwise no facilities so come prepared! The closest shops and cafes are in Marahau (about 10 mins) or Kaiteriteri (about 15 mins). 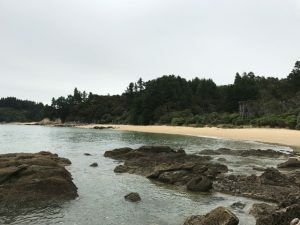 If you’re taking a water taxi to or from the Abel Tasman National Park, there’s a good chance you’ll go up to the rock and be told the Maori legend about why it is split! Address: end of Moonraker Way, Kaiteriteri. The car park is small and does get busy but you can also park at the top of the hill without adding too much extra walking!